Our company has made tremendous breakthrough in the manufacturing and exporting of Astronomical. We have lots of collections of Astronomical items which are fabricated from high grade raw materials which is procured from our most certified and trusted vendors. In addition to this, we have varieties of sizes, dimensions with excellent quality and great reliability. Astronomical Telescope is a classical physics instrument for planetary observations. We have a huge range of telescopes available with us. Pan view sky series (t70060) right angled viewing for astronomical observation, 60mm objective, 2.5x, 15x17x45x75x star finder scope, 225x50mm interchangeable eyepieces, terrestrial eyepiece for ground observation and robust full height retractable tripod. 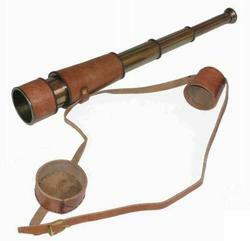 Overall length of telescope is about 68 cms. It is fitted with 50 mm dia, 60x achromatic objective of Focal length 22 inches . The telescope is mounted on pillar having universal motion. 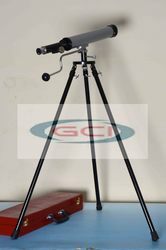 The whole telescope is fitted on epoxy finished metal tripod stand about 4 feet high (adjustable). Telescope is packed in a velvet box. same as above but fitted with 62mm dia objective. Worlds Only Best Astro photography Telescope with high precision NEQ6 GOTO mount..
A device to know star position in sky . Offered by us is an Astrolabe, that is the model of a historical astronomical instrument that was used by astronomers, navigators and astrologers.